You’re in for a real treat this week! You may have seen this event recently published in Occasions Magazine, but we have many more details to share with you today after impatiently keeping these under wraps for nearly a year! In fact, this may be the largest blog post we’ve ever put together. So if you enjoy Halloween as much as we do, we have an interview below from the party host, Deborah Franklin, and we’ve posted over 200 photos from this event on the Whimsical Gatherings‘ Facebook page so you can find inspiration for your own holiday soiree! Deborah Franklin was one of our most memorable clients, no doubt. When she enlisted us to create an over-the-top Halloween birthday party for her, we were thrilled to have this project to work on. Almost everything you see here was done in-house by the Whimsical Gatherings team. 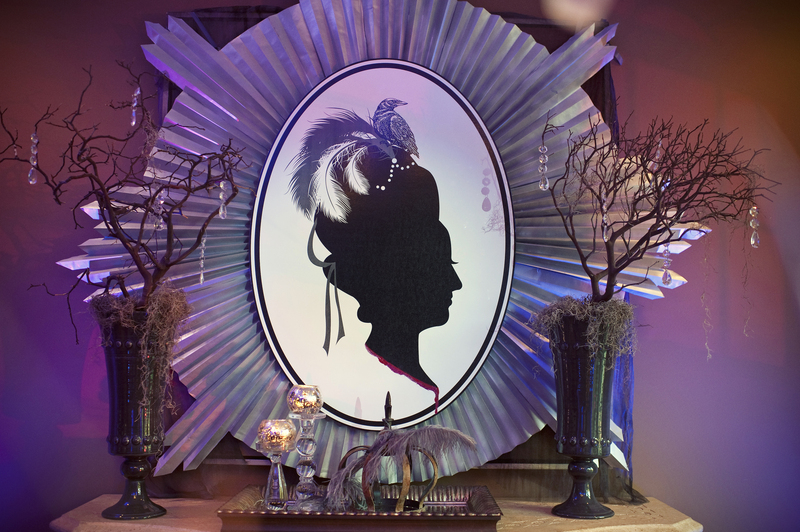 All of the graphics and most of the spooky decor was pieced together over several months to create the perfect scene for Deb’s Old Hollywood Dead Celebrity theme. We had many of our favorite vendor friends help out on this too; Ogle Entertainment and Ambiance Light Design (lighting), Holly’s Eventful Dining (catering), Rita’s Bakery (petit fours), and Grim Limos (hearse) were just a few. All of the magic was captured by Jennie Andrews and we thank her for providing us with so many detailed photos from this celebration! Deborah was born on Halloween. She is neither a witch nor a zombie, but she maintains a fearless fascination for all things mystical and magical. That’s why, for her 40th Birthday, she decided to transform her home into a living morgue of laughter, music and dancing. Knowing that the right wig could transform the meekest wallflower into a dance-until-dawn diva, she decided to hit the streets of Hollywood for her Halloween inspiration: The Dead Celebrity Bash. Below we share with you a few of the birthday girl’s tricks & tips to throwing the Halloween party of your dreams! Ghosts. Ghouls. Glamour. Guests stepped out on the red carpet for a fabulous, frightful night immortalizing their favorite dead celebrities. The dance floor shared the likes of Jackie O, Audrey Hepburn, Whitney Houston, Julia Child, Liberace, Anna Nicole Smith, Marilyn Monroe, Steve Irwin, John Belushi, Steve Jobs, Andy Warhol, Freddie Mercury, and multiple Amy Winehouses. Even an Osama bin Laden and Mother Theresa made an appearance! What was the most memorable part of your event? Seeing my guests walk up the red carpeted steps and watching them being bombarded by camera flashes and paparazzi provided by Genna Sellers and Adam Sullivan. Michelle Carringer was the emcee announcing names as they arrived. And I knew the party was a success when my guests were calling me from within the house on their cell phones trying to locate me in the crowd. What did you serve to your guests? Holly’s Eventful Dining worked with me to create a spooky presentation of common party foods; skewered satay beef, blackened shrimp, crab wontons, candied bacon, pigs in a blanket, Asian mushrooms, stuffed jalapenos, fried pickles, fig & goat cheese profiteroles, chocolate mousse cups, and french macaroons. Rita’s Bakery created the petit fours and Whimsical Gatherings created the display signs. Who made your wig? Stephanie Lindorfer created my Marie Antoinette wig with spider accoutrements. She worked on it for many months! For the first time, I had my costume made for me. The seamstress was behind and the dress did not arrive until the morning of the party. The dress weighed about 50 pounds and I had to continuously shed layers throughout the night! Don’t sweat the number of guests that will attend. I have learned that if you set the tone with an outstanding invitation, guests won’t want to miss your event! Yes, I still send REAL invitations with specialized stamps (this years’ said “The End” in old Hollywood silent film style). I do not believe in email invitations. I want my guests to feel like they just opened the envelop holding Willy Wonka’s Golden Ticket. I want my guests to feel special and get excited about creating their costumes. What was your biggest “splurge”? The lighting! The uplighting done by Olge Entertainment & Ambiance Light Design on both the exterior and interior of the house created the perfect drama as guests arrived. It escalated this annual party to a dramatic event that everyone would remember. I also provided a Champagne Bar because nothing says festive like bubbles! And for the “men folk”, I set up a special Bourbon Tasting Bar with a variety of bourbons for their sipping pleasure. Was there entertainment? When I was planning the flow of the party, I considered each room like a different scene of a play. Each room had its own sub-theme and actor’s dialogue. For instance, the dining room was hosted by a straight-from-the-grave Julia Child who reminded folks that she added “just a touch of poison” to make things taste so good! Julia would then direct guests down the hall into the master bedroom playfully referred to as the “Red Light District”. Once there, guests were greeted by the most memorable Marilyn Monroe lounging on the bed with a framed JFK looking on. In the master bath tub, there was an “Ode to Whitney Houston”. In the library, Tarot Card readings were offered by Tea & Tarot to those who dared. And outside on the back porch, a neighborhood band called Flying North emulated the Beatles with their tunes and mop tops. We also had a DJ with dancing and Karaoke as the night carried on into the morning hours. Did you DIY any details? My neighborhood got together about a month ahead of the party to create a short zombie film. My friend Ryan Flesher produced “For The Children”, which had a cast and crew of fifty neighbors, friends, and family pets including my standard poodle puppy Ribeye. The film made its premier on the night of the party after all of the guests had arrived. What have you learned over the years in planning these parties? Do you have any basic rules? 1.) You can never have enough ice. 2) Empty out the trash one last time 20 minutes before the first guest arrives. 3) I usually don’t hire a bartender, but I do like to have a couple of “circulators” who can refill beverages, restock the food tables, and keep glasses picked up throughout the evening. 4) Fake eyelashes and heavy eyeliner are a must for any event being photographed!